Traditionally, sales of new PCs slump a few months ahead of the release of a new version of Windows. Would-be buyers tend to postpone purchases because they want the next-generation operating system to be included "free" in their next PCs. It was understandable for those suffering with Windows Vista, to hold their breath and jump on the Windows 7 bandwagon as soon as possible. But waiting for the release of Windows 8 may not be the best strategy for you. In fact, right now may be the best time to buy a Windows 7 PC. Don't worry about obsolescence. 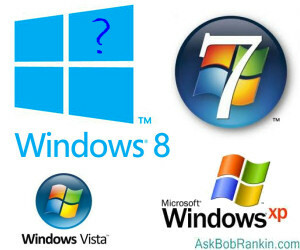 Microsoft is not going to drop Windows 7 the day Windows 8 comes out. Even Windows XP, released eleven years ago, is still in use on about one-third of Windows computers. Microsoft still provides security-related updates for Windows XP (and will do so until April 2014), as long as your copy is up to date with Service Pack 3. Vista, the short-lived Windows mistake of all time, is still in use, too. So a Windows 7 PC purchased now will be supported for years to come, long after you need yet another new computer. Falling demand for PCs means lower prices, another good reason to buy now. HP, Dell, and other big names have reported double-digit percentage slumps in PC sales so far this year. It's not just that people are waiting for Windows 8; PCs are being replaced by tablets and smartphones in many consumers' budgets. Summertime traditionally dampens PC sales, too. Back-to-school sales depress prices further. So the summer may be the perfect time to buy that Windows 7 PC. The radically different user interface of Windows 8 is another reason to buy a Windows 7 PC now, in the minds of many consumers. By all accounts, the familiar "legacy" Windows desktop that is built into Windows 8 is a far cry from what users are accustomed to. It seems that certain operations will force you back into Windows 8's Metro UI, which will be very frustrating for users. Those who have downloaded the Preview versions (See Download the Free Windows 8 Consumer Preview) complain that the Metro UI seems to be designed primarily for touchscreen users, and those who attempt to navigate it with a good old fashioned keyboard and mouse are likely to be confused and annoyed. If you want to avoid a steep learning curve, buy a Windows 7 PC now. Hopefully, Microsoft will make changes to Windows 8 so the familiar desktop interface is an option, and not something shoehorned into the new Metro interface. Then there are the usual problems with any new version of an operating system. Despite the fact that thousands of users get the opportunity to test out pre-release versions of the software, it's normal for a new operating system to contain plenty of bugs and security vulnerabilities when it is first released. Peripheral makers and software developers will have to iron out incompatibilities in their products. If you have lived through these "birth pains" in the past, you may want to sit them out with Windows 7 until Windows 8 irons out its inevitable wrinkles. We really don't know what a "made for Windows 8" PC may look like, or whether it will be accepted by the desktop-bound market. Personally, I like things just the way they are under Windows 7, and am not looking forward to the learning curve of the Windows 8 interface. But if you wait until after the October release of Windows 8, you may not be able to buy a new PC with Windows 7 installed. We don't know how long Microsoft will continue to offer Windows 7, but it's certain they're going to be pushing vendors to install Windows 8 on all new machines. Bottom line, if you need a new PC soon, I would recommend a Windows 7 PC without hesitation. In fact, I'm in that position myself. I have three PCs in my house now, a desktop and laptop running Win 7, and one that's almost six years old with XP. I'll probably upgrade my laptop to Windows 8, because I need hands-on with the new OS in order to stay up to date with technology and answer your questions. But I'll be looking for a new desktop PC with Windows 7 to replace the XP machine soon. Most recent comments on "Why NOW is a Good Time to Buy a New PC"
I am still using XP and love it. I've been hesitant to upgrade to Win 7 because frankly, I hate change when it comes to my OS. I'd appreciate hearing from anyone who went from XP to Win 7 as to how easy it was to adjust to. I have tried Windows 8 preview and will not upgrade. For my desktop it would require new monitor and for my laptop, just over a year old either not or a new laptop as it does not have a touch screen either. I started in computers when they had tubes and have had Windows since 3, did beta testing for 95 and XP but in my opinion Win 8 is another Vista that I don't want. Perhaps it will be great on the M$ new tablet for those folks who like Ipad and such but for those like me who just want a good functioning computer either XP or 7/64 Pro is the way to go. My son is an IT for a very large title corporation which is sticking with XP as good solid business machines. I'm a month into an HP Pavillion (P7-1225 with 8gb and 1TB HD) and really like it. It's quiet and fast. Got it for under $500 from Staples. Had a couple hickups but free HP support, IM and phone, straightened everything out. Frankly, I'm 67 and really don't want to learn another new OS, especially since everything is working fine here. Very well stated article, Bob....I was surprised that you didn't mention the upgrade from Win 7 to Win 8 for those that buy a new PC after June something (the 8th I think). Really that's the best of both worlds. Personally I was very happy with Vista once they got the SP's out and now I have installed Win 7 on 3 of 5 PC's and they all dual boot to Mint...which I find myself using more than any other OS for day to day stuff. In fact to me Mint is much easier to get used tho than Win 8 which I did try, but dumped after a day or two when I realized I was getting frustrated "beta" testing for MS at my own expense. Shame on me. As a lazy octogenarian happy with XP, I've been most displeased about everything I've seen and read about Win8 - I anticipate grief enough learning Win7. I've put off any buying since the much higher hardware requirements for 7 (and 8) have jacked up our laptop prices fiercely, especially with competition inhibited by the hard disc shortage after the floods in Thailand, still an issue. I'm hoping for a better deal on Win7 laptops for my wife and myself by November, which should last us the rest of our likely lives. I've been running Win7 on my laptop for about two years but I'm thinking of upgrading to a new laptop. I've kept all the software I run upgraded and (security) patched and I'd like to stick with Win7. Usually when you get a new computer, you're stuck with re-installing all your software. Since the original software CDs are old, you'll have to spend additional time getting the software up to current release and security levels on top of moving all your data! Would it be possible to just create an image of the hard drive of my old laptop (onto an external drive) and then load it onto the new computer? 5 computers here, 2 desktops and 2 laptops running Win 7, and an older laptop running XP. I shall NOT be upgrading any. While I would prefer the XP, an IBM x30, be upgraded to 7, I do not believe it can handle it. As for the others, I have tested Win 8 on one of my laptops (I removed the hard drive with Win 7 on it and placed Win 8 on another drive), I decided after much testing that I preferred (by a huge amount) Win 7. However, I will be purchasing a new Cell Phone in the fall and will probably consider the new Win 8 phones. But for my desktops and laptops, it will continue to be Win 7 (when possible). I don't understand the comment "Vista, the short-lived Windows mistake of all time". I have absolutely no problems with Vista. However, I am looking to upgrade so I will probably take your advise and go with W/7. I didn't jump on the bandwagon immediately after Vista came out and don't intend to do so with W/8. I like to wait awhile and see everyone comments first. This is a great article. I had upgraded from Vista soon as Win 7 beta came out, I never looked back. I went through Win 7 RC and when it was fully released, I got it pre-ordered. Now on SP1, Win 7 is solid. I have never got a blue screen, never hung. My experience with Win 8, both Consumer Preview and now with Release Preview, it will take me a while to get used to it, but there are still apps that don't work out. I've even gotten, "not made for this release of the operating system" and "please upgrade to a newer version of Windows." Ok, not full release yet, but like with Vista, if your apps don't work, it is frustrating. But I really hope there is a "classic" setting in Win 8, or I won't be getting it anytime soon. I actually have 3 licenses for Win 7 sitting around, I was going to build another PC, but instead got a tablet. If I end up with a preinstalled Win 8, if there is no "classic," I am going to downgrade them to Win 7. No thanks. I'll stick with XP as long as I can. By then it will be time to switch full time to Linux or spend more time on my tablet as I am now. No, you're not crazy - Vista was the last MSOS Outlook Express and Media player were good. Vista has many problems but if you're happy with it great! However Vista has many problems and Win7 fixed them. Win7 with VLS media player and any number of mail programs are well wothwhile. Win8 looks like a magnificent user program, but not for those of us who have to create. I have it on an HP tablet because I have to know how to make it work and for tablets it looks like it will be good. At this oint you don't want it for anything without a touchscreen. I have only ever used XP and VISTA. VISTA is fine for me and copes well with the heavy demands put upon it. My desktop with XP has expired so I too need a new machine and think an all in one will be my root, albeit I really only need a new and more powerful tower: keyboard, mouse, monitor and sound peripherals are already as good as one can get. I simply do not like Windows 8 and see no need for it. If it was not for all the expensive soft and hardware I have, I'd consider the iMac. My Laptop uses VISTA and (ASUS G1) has an Intel core 2 Duo, Nvidia GeForce 7700 graphics. I run tests against all those others on Ashampoo's database and it always beats systems that it should not - W7 and XP. If your computer is optimized properly, VISTA is not a problem. 1. the question is Am We able to use same Acer Hard disk on other model same brand or another brand that was originally install on a certain Acer Model? 2. or are there any way one can open the OS on another Model or brand to get files or backup, if one day the Laptop ( XP )break down ( the hard ware )? This is to pattymac who is worried about the transition from XP to Windows 7. I made the transition two years ago with few problems. If you need help, Microsoft has many video tutorials that are easy to understand and very helpful. I am an older lady, not exceptionally computer literate;if I can do it, you can too. I did purchase my computer from Best Buy and let a Geek Squad agent set it up for me. Pricey, but the resulting lack of problems was worth the money. Good luck! I'm a middle-aged guy, not especially techie, but not a novice either. I've had numerous desktops from Win ME to Win 7; and I'm planning to buy my first laptop EVER in a few months. Currently dual-booting my Win 7 Pro with Win 8 Consumer Preview. Haven't gotten around to the Release Preview yet, but unless the RP is significantly different from the CP, I have no desire for it. My game plan is to buy during what may be a brief window (no pun intended) during which the full line of Ivy Bridge CPUs are available to choose from preinstalled; but while Win 7 is still available to run it with. @Pattymac: I have been using XP for a while too and really love how stable the system was and that was switching from Windows 2000 which was another great OS. I was kinda of wary myself to switch to W7 but once I made the step, there was no turning back. I unfortunately had both of my laptop stolen in a robbery which sucked because I was without any PC for a while. I was then handed down a Vista OS which to my standard sucked and really hated it. I had heard all types of stories about it but never got to witness it until then. After the hard drive gave out on the PC, I replaced it with another one and went back to XP which again was pretty much flawless. I then was able to afford another W7 OS and was so happy to be back into it. It makes life much easier and there are no worries as far as compatibility issues with software that normally ran on XP and not running on W7 since there is an option built into W7 that lets you choose what OS it needs to run on. I have numerous software that I purchase and that ran on XP and after making the transition to W7, it was not an issue at all because of this small option and there is a lot more feature that I am still learning and discovering with W7. It never stop to amaze me and I am glad I have made the step. I am the type of person that never jumps out when new technology comes out since there are bugs that still needs to be worked out but after that, I am up for it as long as it is worth it and that I really need it. That said, I would say that it is safe to go forward with Windows 7 and don't worry about it. You will enjoy it and I would suggest to go to Best Buy or Fry's and fiddle around with the PC and kinda familiarize yourself with W7 before making the jump if you are unsure because this is what I do when I want something as far as electronic goes. That way, you are sure that you will be satisfied with it. There is nothing wrong with testing out the water before swimming. I hope that this helped and good luck. I agree with the message of the article, but regarding Vista being the short-lived Windows of all time, I firmly believe Windows ME was the worst, period. I have helped friends and family members who have Vista, and while I am not a fan of it, Windows ME was an absolute embarrassment.